RICHMOND- Governor Terry McAuliffe and Virginia Tourism Corporation today launched the Virginia Oyster Trail, a major tourism development project connecting travelers to Virginia oyster purveyors, raw bars and restaurants, and the watermen culture throughout Coastal Virginia, the Northern Neck, Middle Peninsula and Virginia’s Eastern Shore. The “ribbon-cutting” ceremony held Monday, Nov. 9 at the Tides Inn in Irvington, Va. kicked off the celebration of the Virginia Oyster Trail with a reception featuring Virginia oysters, wine, beer and craft spirits. Other distinguished guests of honor included First Lady Dorothy McAuliffe, Secretary Todd Haymore, and Deputy Secretary Russ Baxter, who shucked oysters to commemorate the opening of the trail. A public-private partnership of stakeholders began working together to brand the Virginia oyster travel experience to show the world that Virginia is for Oyster Lovers. The trail offers visitors a way to enjoy Virginia’s seven different oyster regions, as well as experience the unique culture of watermen in the Chesapeake Bay. 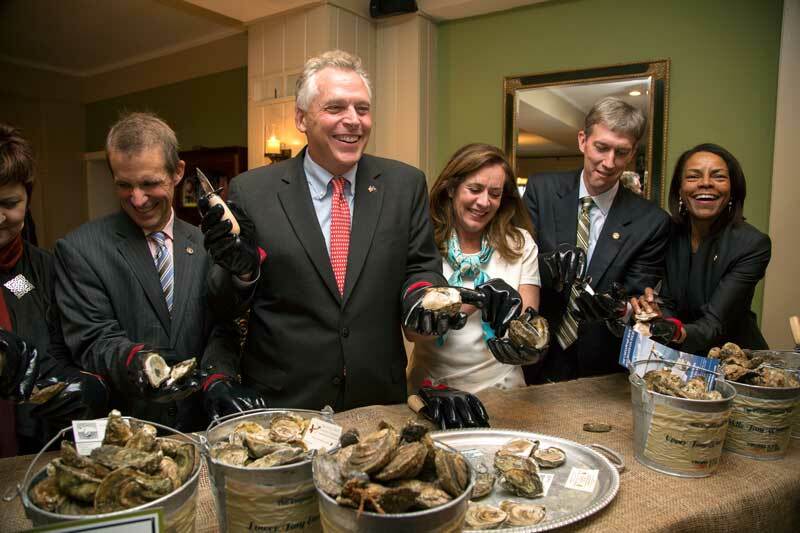 “The Virginia Oyster Trail is a great new way to leverage all of the benefits Virginia oysters bring to local communities and our efforts to build a new Virginia economy,” said Governor McAuliffe. “Virginia oysters help foster tourism, community development, agriculture, environmental stewardship, entrepreneurial growth and cultural integration of Virginia’s distinctive coastal way of life. Virginia produces the best oysters in the world, and as the oyster industry continues to grow, we want it to be known that Virginia is the Oyster Capital of the East Coast.” Virginia is leading east coast seafood producer and the third largest in the nation. Virginia’s oyster harvest increased by 31 percent during the 2014 season, with more than 658,000 bushels, with a dockside value of more than $33.8 million, the most in nearly a generation. Virginia’s seven different oyster regions produce the largest quantity of fresh wild-caught and farm-raised oysters in the United States and each region produces oysters with distinct flavors, offering an oyster for every palate. The Virginia oyster industry is one of the longest-standing industries in the state, providing bountiful meals for Virginia’s residents. For more information on the Virginia Oyster Trail, visit virginiaoystertrail.com.